Former Cliftonville and Derry City striker, David McDaid has hit back at Linfield boss, David Healy who questioned his ambition. Healy had a pop at McDaid, who stunned Linfield when signing a two-and-a-half year deal with Larne on Saturday, suggesting the striker ‘couldn’t handle’ the challenge of playing for the champions. The former Cliftonville and Derry City striker made the shock decision to snub a long term contract tabled by the Windsor Park club in favour of signing for Tiernan Lynch’s ambitious side, who are bankrolled by Purplebricks co-founder and multi-millionaire businessman, Kenny Bruce. And the 26 year-old Creggan man hit back at Healy’s comments, suggesting his decision to join the Larne revolution doesn’t reflect favourably on the Blues boss. “If David Healy really believes that then he forgets I played for Cliftonville, who were champions when I joined, for three years,” blasted McDaid. “I think it’s a case of sour grapes from David Healy. I just wanted a fresh challenge and a long term project. I think it’s a case of sour grapes from David Healy. I just wanted a fresh challenge and a long term project. “I’m sure it doesn’t look good for him that I snubbed Linfield for Larne because that’s unheard of,” he added. “Coleraine, Glenavon, Sligo and Finn Harps were all heavily interested too. But it doesn’t look good for Healy as a manager of Linfield - one of the biggest clubs in Ireland - who can’t compete with Larne for a signing! 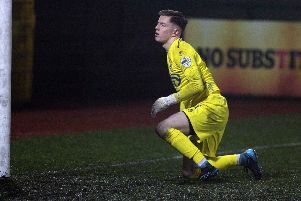 McDaid’s signing comes as a huge statement of intent from Larne and the striker admits he was sold by the manager’s vision of building ‘a Premiership team in the Championship’ with plans to invest in the youth structures and develop the stadium. After a season with Waterford in the League of Ireland First Division, McDaid had earlier claimed it was ‘the right time to go to Linfield’ and was on the brink of joining the champions ahead of advanced talks. However, he made that unexpected u-turn once he listened to Larne’s ‘exciting’ sales pitch and realised the club are ‘serious’ about plans to compete in the Danske Bank Premiership and in Europe in the coming seasons. “Larne was the first club to contact me and I said I would speak to them,” explained McDaid. “And I met with Larne and Linfield on the same day. I met the new Chairman and owner of Larne along with the manager and I really liked what he’s trying to do with the club. There’s been rumours McDaid has been offered ‘outrageous’ financial deals to sign for the Championship outfit including a £10,000 signing on fee but the striker rubbished those claims. “Everybody has been ringing and texting saying they’ve heard I’ve been offered ‘x’ amount but to be honest, while I’m the highest paid player at Larne at the minute, its probably a standard wage for any footballer in the Premiership. “If you play there five, six or seven years you never know where it will end up. “It’s a long term plan. I went to Waterford and knew it was never going to be long term. I went there as a stop-gap hoping I could have a good year and then get somewhere permanent. Larne are rumoured to have agreed to bring in several top class additions to the squad in the January transfer window and McDaid’s signing is expected to be the first of many proven Premiership stars to arrive at Inver Park. “They’ve told me that once they get one big named player who has won things, and they wanted it to be me, then it will get the ball rolling. “If we get one big name who has played in the Premiership and has won things then other players will join because they’ll realise we’re serious. “The manager is working really hard at signing players and I know a couple of Premiership players are signing in January 100 per cent already.